Lately at our house, we’ve been doing yoga after dinner. We found a great resource called Cosmic Kids Yoga. What we love about it is that its really developmentally appropriate for young yogis! 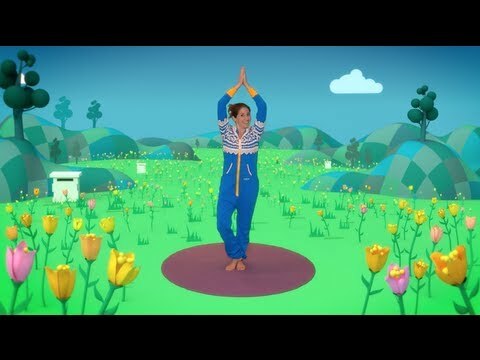 Each 10-15 minute video is an adventure story where children (and parents) are led through a series of yoga poses as part of the story. Both my daughter and I are enchanted with the teacher, Jamie. She’s expressive, engaged and her instructions are clear and easy to follow. The stories have a moral and the themes are reinforced during the short relaxation meditation at the end. My very favorite so far is “Kickapoo the kangaroo.” I like it because young Kickapoo is a fearless explorer of the outback and because we get to jump around at the end singing “Tie me kangaroo down, sport!” It’s impossible to do without a huge smile on your face! Jamie, your Cosmic Kids instructor. My daughter tuned out traditional yoga instruction–even for kids–after the first minute or two, but she stays with this until the end. And then, after the video is over, she wants to teach me yoga. So, we have another good 10 minutes of exercise while she makes up her own stories and shares them with me. The poses may be a bit “creative” but the combination of exercise, imagination and fun makes up for that. At one point in my life I was quite a yoga “purist” and I probably would have had a lot of negative things to say about “Cosmic Kids.” Now, as a mom looking to engage a younger person in some body-based contemplative practices, I think it’s just great. I also like it as an educator because it is a wonderful example of how we can teach young children many different topics by engaging their imagination. For example, early years math really shouldn’t come from a text book or a worksheet. With a few simple props and a story line, students can be practicing exactly the same number concepts by running a store, playing bank, or building with blocks. As educators, we just have to get more intentional about designing these learning activities and documenting the learning. So, give Cosmic Kids a try and let us know what you think! Author sdreyerleonPosted on June 5, 2014 June 5, 2014 Format LinkCategories UncategorizedTags Cosmic Kids, education, Kids Yoga, mindfulness, problem-based learning.1 Comment on Kickapoo is not afraid!